Those reports about a new scheme to "stimulate sales of CD-length music" were true, and then some: Along with extras for albums and movies, iTunes 9 comes with media sharing (!) and iPhone app management. Updated with walkthrough gallery. iTunes LPs: These are effectively like bonus CDs for digital albums. Each one comes with extra songs that you only get if you plunk down nearly $20 on the whole album—you can't download these individually. Along with that, you get video content—in most cases, live concert recordings—as well as photo albums and lyrics, which serve as a sort of modern-day liner notes, I guess? It's a bit like buying one of those loaded-up "Digipack" CDs record companies used to release, except on iTunes. Many albums come with a special custom display mode, so all this fancy new content isn't just dumped into iTunes' regular audio and video browsers, which would seem like a waste. iTunes Extra: Like iTunes LPs for films, this gives you a downloadable equivalent of DVD extras for films, with interviews, supplemental clips and photo galleries. Some of the extras, like the ones for Wall-E shown here, are a little more interactive, and have their own distinct interface. A New Store: As for the storefront itself, all content is now organized in a new layout, which looks a lot more like a software interface, and less like a heavily formatted webpage. For example, you can now quick-view albums, which opens Preview-style windows that let you see what's behind a given link in the store, and there's an ever-present menu bar that lives up top, replacing the cumbersome breadcrumb navigation from before. A Tweaked Interface: Apple's rearranged a couple of interface elements here, moving the "Artists" browser to the far left as tall column, and changing the color of the app chrome so it's a little lighter than other apps, which is a bit odd, and visually jarring. Media Sharing: The software's getting some pretty fantastic new functionality outside the store as well—it's got media sharing, at least on your local network: You can copy songs, movies, and TV shows to up to 5 authorized computers, or simply stream them. This is pretty huge, and a definite about-face for Apple, which has been slowly stripping out sharing functionality from iTunes from the beginning. An App Manager: On the iPhone/iPod front, now you can rearrange and manage apps from within iTunes, which was one of those stupid-simple feature upgrades people (and by people, I mean we) have been clamoring for for months. Apple's version of the app manager is better thought out than the concepts we've seen before, which were already droolworthy. Apps can be dragged and dropped, either alone or in groups, and selectively synced. Awesome. Syncing, Genius and Social Networking: A few odds and ends here—iTunes 9 also brings finer sync controls, including options to sync genres or artists instead of just playlists, and more options for video and photo syncing. There are also new "Genius Playlists," which are just general library mixes that iTunes thinks you'll like, rather than the old Genius playlists, which were based on a particular artist. Social networking support is nowhere near as deep as rumored—it just gives you shortcuts to spam your friends with links to iTunes store pages over Twitter, et al. Apple's also thrown in a little treat for Windows users: Playback controls from the Windows 7 task bar.—Thanks, Daniel! The Palm Pre: No longer works. Soon, it probably will again, then a few months later, Apple will break it with another update. And so on and so on, forever. But on the whole, this release raises just one big question: iTunes, did you just get good? 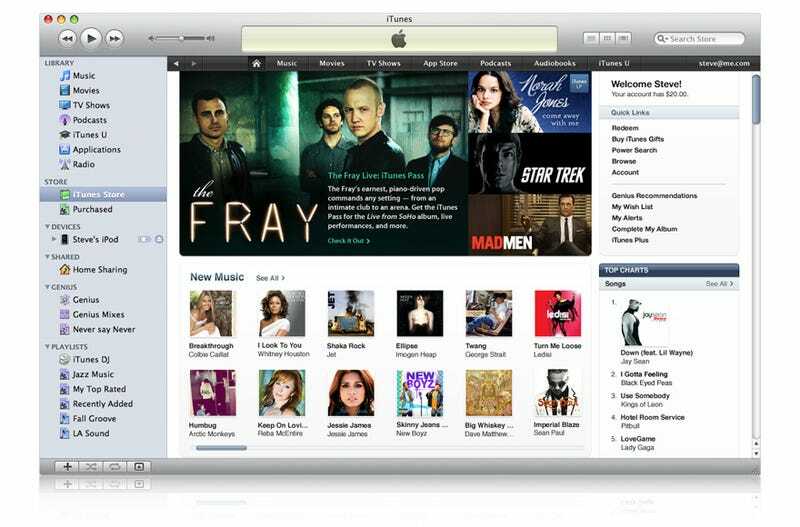 iTunes 9 is available today, as is plenty of iTunes LP and Extra content. For more, stay tuned to our liveblog. SAN FRANCISCO, Sept. 9 /PRNewswire-FirstCall/ — Apple® today introduced iTunes® 9, the latest version of the world's most popular software application to purchase, manage and play media, packed with innovative features such as iTunes LP, Home Sharing and Genius Mixes, as well as a redesigned store and improved syncing. iTunes 9 makes it easier than ever to discover, purchase and enjoy your music, movies, TV shows, and apps for iPhone(TM) and iPod touch® from Apple's revolutionary App Store. Plus, Home Sharing now lets you easily transfer songs, movies and TV shows to other computers in your home.